In our family, we celebrate Shabbat each week and Passover each year so I wanted to look at the Jewish ‘High Holy Days’ as they are known, to find some rituals we could use to enrich our faith at home. I’m not going to give an exhaustive overview here, (because you have google too!) but focus on what elements we could adapt and use. In Autumn there are three main Jewish festivals: Rosh Hashana (Jewish New Year), Yom Kippur (the Day of Atonement) and Sukkot (Festival of Shelters). Rosh Hashana this year is on 21-22 Sept and is followed by the Days of Awe, ten days of soul searching and repentant prayer. These lead up to Yom Kippur (Sat 30 Sept), the day of forgiveness. Succot follows on five days later (this year on 5-6 Oct). 2 Grease your mini-muffin tin. 3 Mix 2 cups plain flour with 1 tsp baking powder, 0.5 tsp baking soda and a pinch of cinnamon. 4 In another bowl mix 2 eggs, 0.75 cup of honey, 0.5 cup coffee, and 1 tbs coconut oil. 5 Mix the ingredients of the two bowls together. 6 Add 2 small diced apples. 7 Fill the mini-muffin tins to the top. 8 Bake for 12-15 mins. If you’re more of a bread person, why not try making a round, honey-dipped challah bread instead? The shape represents God’s King of the Universe crown and eternal life. 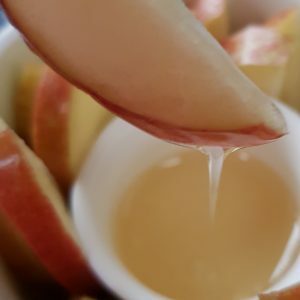 You’ll find good recipes at www.toriavey.com We also found this fab song to go with dipping apples in honey. I know lots of families do TSP prayers, encouraging their children to say Thank you, Sorry and Please each day. We do a weekly ‘sorry’ when we wash our hands at our Shabbat meal on a Friday, but I like the idea of using a different physical ritual to let us imagine and experience God’s forgiveness in a different way. If you don’t have any water near you, you could ad lib with a bowl or the bath! During Rosh Hashana, the whole of the story of Isaac will be read from Genesis 21-22 in the synagogue. I love the idea of reading large chunks of the Bible, so our challenge is to find a good time to read this whole story from the Bible (we’ll read chapters 23 and 24 as well, and might also do the Godly Play version which will give us a shorter overview but also a way to play with the story and explore where we are in it). This is done by some Jews on Yom Kippur as a symbol of purity because it’s a day of spiritual cleansing. It may also relate to the special garments the High Priest wore when doing the rituals in the Holy of Holies as written in Leviticus 16. Why not try wearing one white item for the day as a way of remembering what Jesus, our Great High Priest did for us (Hebrews 4:14-16). The main ritual for Sukkot is to erect a sukkah, a small, temporary booth or shelter, and ‘live’ in it for seven days (this year Oct 4-11, five days after Yom Kippur). Sukkot commemorates the 40 years God’s people wandered in the desert and the shelters represent the frail huts the Israelites lived in in the desert, and how God provided for them then, and by inference, provides for His people today. Living in the shelter is interpreted in many ways. Why not try sitting, eating (a meal or a snack), star gazing, playing a game and even sleeping in it. We have made a shelter in various ways, including putting up a tent in the garden. Traditionally the booth is covered with fruit, as Sukkot is a celebration of the Autumn harvest. You could make a ‘den’ using bamboo sticks and cover it will a sheet, and eat a meal or a snack there. Chat about what it would have been like to live in the desert. What do you think you would have enjoyed? What might you have disliked? Wave branches and a lemon! The details of the festival of shelters can be found in Leviticus 23:33-44, including the verse which says to “take branches from luxuriant trees—from palms, willows and other leafy trees—and rejoice before the LORD your God for seven days”. One Jewish tradition is to do this by making a lulav, which is a combination of date palm, willow and myrtle branches, held together by a woven palm branch. The etrog, is a fruit a bit like a lemon with a citrus smell. A prayer is said over the lulav and etrog then they are waved in six directions—north, south, east, west, up, and down – to symbolize that God can be found in all directions, not just in one place. Traditionally the Psalms to read during Sukkot are Psalm 113 – 118. Why not try reading one each day for a week? I absolutely love this! I’ve been really inspired by your ideas for celebrating Shabbat and so we have just starting celebrating this in our home too using your servicw sheet and it’s brill. When I think back to my childhood, the key memories are centred around tradition and celebration, and even as an adult when I go back to my family home I still get excited about traditions that I know will happen! I will definitely look into these autumn rituals – would love to hear your ideas of fun ways to celebrate other festivals with children in the different seasons too! Have you come across any childrens books on shabbat which talk about Jesus too?